Privacy and security are major concerns for every Windows 10 user in this era of telemetry and data collection. Today, we'll address these privacy concerns and will learn how to protect our private data and information while using a Windows 10 computer. Almost all of the privacy tweaks and tricks mentioned in this guide can be implemented by technically challenged too. Though some of the important privacy settings should be tweaked at the time of installation, one can do that at a later stage too. Select privacy tweaks are absolutely essential (strongly recommended) while others can be skipped depending on your personal preferences. It's not just about hardening various privacy settings but much of your privacy and security also depends on how you use the applications and Internet in this connected world. In case, you don't feel comfortable with a specific privacy tweak, feel free to revert back to the original settings. 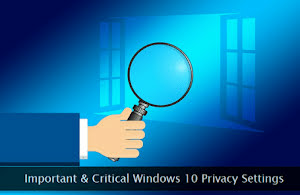 Let's get started and adjust the privacy settings of our Windows 10 PC to minimize the personal data leakage. Note: Whenever you're playing with various Windows settings, always make sure to take a complete system backup to avoid any mishap or an unpleasant situation. It's time to move ahead to one-by-one check all the important Windows 10 privacy settings. So, log in to your PC and follow this guide to safeguard your personal information. You may be wondering why I've advised the same? Well, while installing Windows 10, the process tries hard to convince you to use a Microsoft account. The local account is not highlighted prominently as an alternate option. If you're going for a Microsoft account, all your preferences are saved on the company's servers to be used across all connected devices and with all the online Microsoft services associated with your account. This is not the case with a local account. If you're not comfortable sharing your personal system preferences and settings with Microsoft, go for a local account. But, if you're looking to use Microsoft's cloud-powered services or want to use both free and paid Windows Apps from the store, you'll need to switch to a Microsoft account. I personally prefer classic desktop applications and access all my cloud-powered services via a web browser. This way, I can easily use a local account preventing access to my system preferences data. Though I'll recommend using a local account, in the end, it's entirely up to you whether you are okay with sharing your system preferences with Microsoft or not. Windows 10 personal assistant Cortana is one of the applications that gather tons of information about you and your preferences. To avoid this data capturing by Cortana, you need to turn it off, completely. If you're a Windows 10 Home edition user, use the following registry hack to disable Cortana. Step 1: Press Win + S key and type regedit in the search box. Press enter key to open the registry editor. Step 2: Find the following key HKEY_LOCAL_MACHINE\SOFTWARE\Policies\Microsoft\Windows\Windows Search through a quick search. Step 3: Here you'll find AllowCortana value. If it doesn't exist, create a DWORD value with the same name. Step 4: Set the value of AllowCortana to 0 to disable this information capturing digital assistant. If you're a Windows 10 Pro or Enterprise edition user, turning off Cortana is much simpler. Step 1: Press Win + S key and type gpedit.msc in the search box. Press enter key to open the Local Group Policy Editor. Step 2: Now, go to Computer Configuration → Administrative Templates → Windows Components → Search option. Step 3: Here, change the value of Allow Cortana to Disabled which turns off Cortana on the PC. Though one can use the registry hack method on Pro and Enterprise editions, the policy editor method is always a better choice. First of all, make sure you're already not logged in to the OneDrive service. If you're logged in, simply disconnect and log out from the service. You also need to make sure that the service doesn't start automatically on Windows boot up via OneDrive settings. But, you can still access the service via its icon which is tightly integrated with the file explorer. To remove the OneDrive access icon from the file explorer, use the following methods. If you're using Windows 10 Home edition, use the registry hack mentioned below. Step 1: Press Win + S key and type regedit in the search text box. Press the enter key to open the Windows registry editor. Step 2: Find the following key HKEY_LOCAL_MACHINE\SOFTWARE\Policies\Microsoft\Windows\OneDrive by initiating a registry search. If this key doesn't exist, create it right there. Step 3: Here, create a DWORD value with the name of DisableFileSyncNGSC and set its value to 1 followed by a system reboot. And, if you're using Windows 10 Pro or Enterprise edition, turning off OneDrive is a much easier process. Step 1: To get started, press Win + S key and type gpedit.msc in the text input box. Press the enter key to open the Local Group Policy Editor. Step 2: Now, go to Computer Configuration → Administrative Templates → Windows Components → OneDrive option. Step 3: Here, change the value of Prevent the usage of OneDrive for file storage to Enabled to disable OneDrive on the computer. If you still want to use OneDrive occasionally, use a web browser for the same. Some of the settings accessible via Settings (Home) → Privacy → General are worth paying attention to. By default, Windows 10 enables installed apps to track your app usage pattern through your advertising ID to display better and relevant ads within respective apps. I'll strongly recommend disabling the advertising ID to ensure the apps usage data is not shared with in-app advertising platforms. Another setting on this page shares your language lists with the websites accessed through Windows apps. Turn it off if you do not want local content to be pushed to you on an automated basis. The next one that tracks app launches can be turned off too. If you prefer, you can keep it enabled. And lastly, the settings app itself tracks your usage pattern and accordingly shows content relevant to you. Disable this option to make sure you can focus on the settings configuration while using this app. Location (Settings (Home) → Privacy → Location) is often used by apps such as maps and social media platforms. If you're not comfortable sharing your location with these apps, you can directly disable the location service. If you're already using the location service and have now decided to disable it, make sure you've purged the location history through an option available on the same page. Here, you'll also find an option to restrict select apps from using the location information on your computer. This is (Settings (Home) → Privacy → Speech, inking, & typing) one of the important services which collects a lot of speech and typing data on your computer. Make sure it is turned off along with Cortana personal assistant. And, if you're using a Microsoft account for system administration, make sure you've deleted all the speech and typing data stored on Microsoft's cloud servers. In case you're actively using Cortana and this service, make it a practice to delete this data from the cloud every fortnight or on a monthly basis. All the account related settings and preferences (Settings (Home) → Accounts → Sync your settings) are stored on the local computer. In case you're using a Microsoft account, the situation can be a bit different. In such case, your account settings and preferences may be stored on the Microsoft cloud to facilitate easy syncing of this data across multiple devices. If you're not going to use your Microsoft account on multiple devices, I'll strongly recommend turning off account data syncing option. And, if you're an active multi-device user, you can still restrict the amount and type of data syncing by configuring which data you want to use across all the devices. You can do it on the same page. Whether you're at the office or at the home, sooner or later you may lock your computer and leave the desk. That's the time other people can peek at the screen and may see your personal information. Windows 10 can show a lot of notifications (Settings (Home) → System → Notifications & actions) about reminders, instant message alerts, VOIP call alerts, and so on directly on the lock screen. To prevent people peeking at these lock screen notifications behind your back, disable them as shown in the image above. This is a very important privacy setting one cannot afford to ignore. Skipping it can leak your very private information among peers and family members which can sometimes be very embarrassing. Now, this privacy setting is the one (Settings (Home) → Privacy → Diagnostics & feedback) that needs your utmost attention. Windows generates a lot of telemetry and diagnostics data while you're working on your computer on a daily basis. If not restricted, this data is actively shared with Microsoft on a regular basis. Though one cannot guarantee to stop this data sharing to 100%, we can surely limit it to a certain extent. Without any fail, select the Basic data sending option to minimize the type and amount of diagnostics information shared with Microsoft. The second option indicated in the image can also be disabled to prevent Microsoft from using the diagnostics data in the name of providing custom experiences. A Windows app, if required, can access your account information (Settings (Home) → Privacy → Account info) through which you've logged in. If you're not comfortable sharing the account data with the apps, turn it off completely. Additionally, one can also avoid installing the apps requiring account data for their normal functioning. For existing apps, you can enable or disable account information access on a per-app basis. Make sure to spend some time and audit the apps to determine whether you need to disable access to account information or not. Believe it or not, I rarely use any general Windows app and hence keep this option completely turned off. If you're in the same boat, follow my approach for this privacy setting. Quite similar to account information, call history data (Settings (Home) → Privacy → Call history) can also be accessed by Windows apps. We cannot be 100% sure if a specific 3rd-party app is not storing our call history data on their own servers and is not sharing it with other parties. To address this issue, there two different options. The first one involves turning off access to call history data for all of the installed apps. Or, you can keep access to call history in an enabled state and can disable it on a per-app basis. If the list of such apps is long, I'll recommend going ahead with the first option. Nowadays it's quite common where multiple unpaired devices connect (Settings (Home) → Privacy → Other devices) to a primary computer, wirelessly. Windows 10 provides an option to let the installed apps share information with such unpaired devices. If you're working in a home environment and all such unpaired devices are the trusted ones, you can keep this option enabled. If you're not sure if the connected unpaired devices will use the shared information in a valid and legitimate way, go ahead and turn off this setting. Users can also specify the apps which can communicate and share the information with such unpaired devices. You can also specify the trusted devices for apps. Diagnostics information generated by Windows 10 is also available (Settings (Home) → Privacy → App diagnostics) for apps. If you're using a lot of 3rd-party Windows apps, sharing this diagnostics information with these programs is not advisable. For trusted apps, you can allow diagnostics information access on a per-app basis. I'll suggest giving this access to official or reputed Windows apps. Some apps rely on diagnostics information generated by other apps to function properly. If such app is the one you trust, enable the access for that specific application. A sign-in screen is one of the common screens which is often left open on an unattended computer desk. On this screen, Windows 10 may display account related information (Settings (Home) → Accounts → Sign-in options) including email address too. If it's an office desk, your account information (including the email address) is open to the general public. Therefore, turn off account information display on the sign-in screen without any fail as showed in the image above. The second important option should be kept in an enabled state to ensure the Windows update process automatically processes the account information without any need for human intervention.